Residents of Berwick, Finch and Crysler, just 40 minutes south of Ottawa, are working day and night to prepare for their appeal of the Nation Rise wind power project, scheduled to begin next Monday in Finch. The power project, planned to have a capacity of 100 megawatts of power (though wind power is typically less than 30% efficient) and would see more than 30 huge industrial wind turbines throughout the project area. If it goes ahead, that is. And that’s something many in the community are determined to fight. The project was one of five new wind power contracts awarded in 2016 under the Large Renewable Procurement program (LRP). The 20-year cost of the contract, which will be added to Ontario electricity customers’ bills, will be more than $436 million, or almost $22 million a year. The new Ontario government pledged to cancel all five of those contracts and so far, has dispatched three of them, with an announcement last Friday. Without formal cancellation, however, the community through a citizens group Concerned Citizens of North Stormont, is forced to proceed with its expensive appeal of the project’s Renewable Energy Approval. That approval, or REA, was given just three days before the writ period began for the recent Ontario election—an act that runs counter to the accepted idea that governments go into “caretaker” mode immediately prior to the election. Why a bad decision? The majority of the power project would be built on land that is designated as a “highly vulnerable aquifer” meaning it is at risk for contamination by pollutants, and that the hydrogeology is such that the aquifer could be disturbed and wells for farms, homes and businesses could fail. That’s already happened near a wind power project in North Kent, and the new government has promised a public health investigation. There are other environmental concerns about the project, including the risk of injury from blade failures and ice throw from the huge blades. And then there’s the noise. The industrial-scale wind power generators produce a range of noise emissions which affect a significant portion of the population. The turbine noise can cause disturbance of sleep which results in other health problems; the unique quality of the turbine noise also results in “annoyance,” a medical term for stress or distress. Almost every wind power project in Ontario has been appealed by Ontario citizens, and a few have been successful, but none on human health. 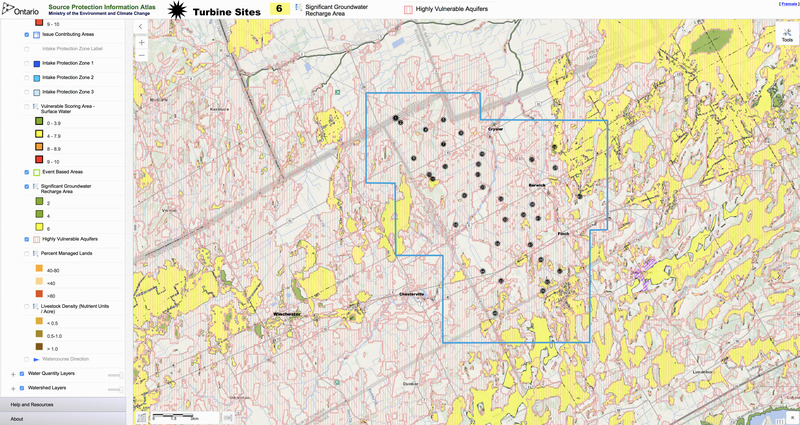 At present, according to Wind Concerns Ontario, there are thousands of official reports of excessive wind turbine noise, almost none of which have ever been resolved. The power developer, Portugal-based EDP Renewables, operates the South Branch wind power project in nearby Brinston; there have been noise complaints for that project, but they are unavailable under Freedom of Information requests because the Environment ministry’s Cornwall office did not follow procedures and issue tracking numbers for the complaints. The appeal begins Monday morning in Finch, at the Finch Community Centre/North Stormont Arena.